The University of Wolverhampton hosted the City of Wolverhampton Annual Skills Dinner 2018 in partnership with City of Wolverhampton Council as part of the City Business Programme. 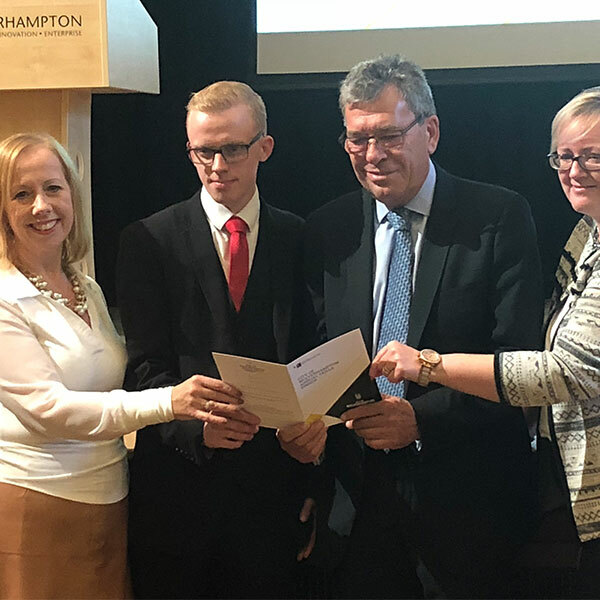 The theme of the Skills Dinner was ‘Improving Apprenticeships in the City of Wolverhampton’ and over 100 guests attended including employers, training providers, school and college heads and city partners from across a range of business sectors. David Loughton CBE, Chief Executive of the Royal Wolverhampton NHS Trust, was guest speaker at the event. He started his career as an Engineering Apprentice before taking up a role in the National Health Service. Jackie Dunne, Deputy Vice-Chancellor at the University of Wolverhampton, said: “The University is a sector leader in Degree Apprenticeships – we now have over 700 Degree Apprentices studying across three of our faculties and we plan to grow this over the next few years. “There’s a real buzz around Wolverhampton at the moment and without a doubt we can achieve so much more together than we can individually. We’ve seen first-hand what Apprenticeships can do for businesses but we also know that there’s a perception that they are only for 16 to 18 year olds or only available in trade sectors. Picture caption from left to right: Jackie Dunne, Deputy Vice-Chancellor at the University, Jack Strickland, former Apprentice at City of Wolverhampton Council, David Loughton CBE, Chief Executive at Royal Wolverhampton NHS Trust and Michele Roberts, Head of the Apprenticeship Hub at the University.